I know I wrote in my last post about how tricky time management has been. That has absolutely not changed. I am five weeks into school, I just signed a lease on a new apartment and am in the process of moving, and I’m still working full-time. Doing just those things has me scrambling. (*whine, whine, whine*) However, as one of my coworkers said the other day, “I’ll sleep when I’m dead”. So, this week, I wanted to talk about one of my nearest and dearest held goals. 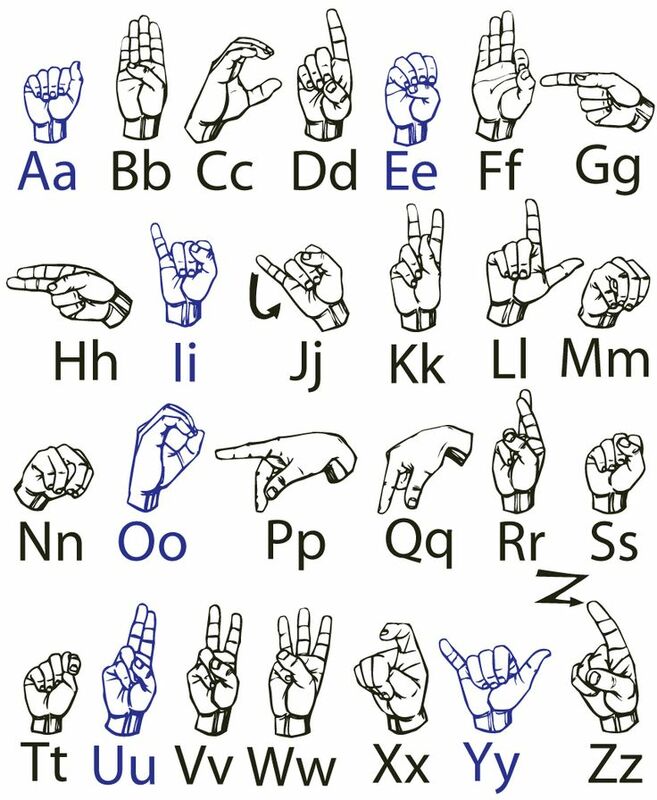 Since I was very young, I’ve been fascinated by American Sign Language. When I was in Girl Scouts in elementary school, I earned a badge for learning the alphabet. (I wasn’t super outdoorsy, so I avoided the ‘build a fire’ or ‘defeat a bear’ badges.) I’ve been hooked on trying to learn ASL ever since. After picking it up and putting it down a dozen times over my life, I’ve been re-motivated recently, because a new friend at grad school is hearing-impaired and she said she would practice with me. Deaf culture is fascinating. I knew so little about Deaf culture before reading up on it, and was blown away reading about the literary, musical, and artistic background, the fights for deaf Americans’ right to education, the nuanced grammatical structure of ASL, and technological strides. 1. Find out more about what it is to be deaf. De’Angelo Brown’s story is a great place to start. 3. YouTube! If you’re new to ASL, a great jumping off point is to check out YouTube videos teaching basic sign language. If you have other suggestions of ways to learn, let me know in the comments! You’re right to start with Bill Vicars! Once you are a few lessons in (especially if you can complete his alphabet lesson), I’d recommend trying to attend some church services in ASL. It can be awkward if you don’t share that religion but people are generally welcoming and you’ll experience real-world sign, plus it’s free. Depending on where you live there may be conversational meet-ups as well which would be even better. Once I understood basic sign then a lot of growth came from immersing myself in ASL videos. Nyle DiMarco has a bunch, DPAN’s signed music videos are fun, the show Switched at Birth has some signing (some characters don’t sign that well), some movies/documentaries are in ASL, and there are some Facebook groups or pages you can follow to get regular ASL videos. Depending on time and money you may want to invest in taking a college course. I took one or two and was able to use the basic grammar rules and resources from the course to study further on my own. Lifeprint will give you some grammar, but is focused more on conversational skills, so I found learning that aspect very helpful, but not everyone does. This is fantastic advice! Thank you so much. I think I’m going to try going through all of Bill Vicars videos first and then look into classes. I’ve heard there are MeetUp groups too, is that true?? Yes, definitely! I was involved with one MeetUp group for a while and it was great. Someone made aggressive advances on a friend of mine at a MeetUp, so exercise caution, but a great one will help a lot. (Deaf culture is very physical, but unfortunately that particular guy was just a jerk.) The best MeetUps have a good mix of fluent signers, new signers, and intermediate learners. Actually that question reminded me that another option is if there are any deaf schools near you or the local Deaf social groups sometimes have ASL meetups or events open to the public. Deaf basketball games are fun! If you find an event that you’re interested in but aren’t sure if it’s open to ASL learners, ask. Most groups are pretty welcoming but some events may be Deaf/CODA only. Some gatherings, including some MeetUps I’ve been to, are “voice off” where no speaking is allowed, which some hearing people struggle with. Having good alphabet receptive skills, or paper to write tricky stuff down on, helps. Thank you so much! I’m sorry that happened to your friend; that sort of thing happens way too often. I’ll have to see what is around! I’m very nervous about being a beginner with folks who are fluent, but I guess that’s really the only way to really learn.